We are happy to introduce to you a few new features of the SoftComply Risk Manager Plus and SoftComply Risk Manager Server version. Data in the risk management table has so far been automatically sorted – the sorting algorithm starts from the left most column in the table and sorts it alphabetically. Next, each column from left to right is sorted alphabetically. This provides an easy to read structure to the table. After several requests from our clients to allow users sort the table by one column of their own liking, we are happy to let you know that we have implemented this feature now. Users can now disable the automatic sorting to sort the data by a column of their own choosing instead. User-enabled sorting is a project specific feature, i.e. user will have to enable it in each risk project. To enable sorting, please go to project settings in the bottom left corner of your screen and you will find “Risk Manager” at the bottom of the sidebar that opens up. After saving this setting, you will be able to choose a column of your own liking that will be used for sorting the data in the Risk Management table. To select a column, just click on the arrows in the header of the column you want to sort the data of the risk table by. By clicking the arrow pointing upwards, the data will be sorted in ascending order in the chosen column while clicking on the arrow pointing downwards, sorts the data in descending order in the chosen column. Textarea stands for longer than 225-character texts that you may want to add as description to your risks. To save the text you are writing in the textarea cells, please use the confirm button from the floating menu as the keyboard “Enter” will not work in this field type. Numbers can be used for additional data and calculations you may want to add to your risk data. Only numbers can be entered to this field and you will be able to use “Enter” on your keyboard to save the number. Date can be used to illustrate the time risk was entered, mitigated, verified or approved. You can then sort your risks based on these dates if needed. Select column type allows you to list a number of options users can select from when adding information into the table. You will only be able to choose one option at a time. For example, you may want to add the type of risk based on which subsystem it is affecting, e.g. Software or Hardware, etc. Multi select column type allows you to list a number of options users can select from and here you can choose several options at once. For example, you may want to add the various components that the risk is affecting, e.g. interface, calculator, algorithm, etc. User column type allows you to add any person from your organization (has to be Jira user) to any risk, e.g. a person who created the risk, a person who reviewed the risk or assigned mitigation action, etc. Version column type allows you to link your risks to a specific software or project release (i.e. Jira fixVersion field). Jira fixVersions field is used to track time-based milestones in a project and organize releases. 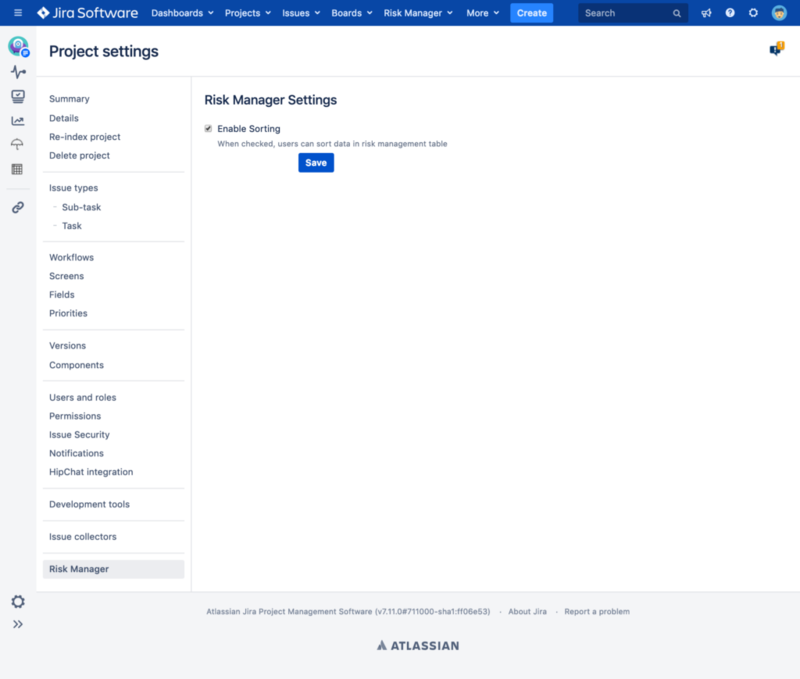 Custom field column type allows mapping an existing Jira custom field to the risk table. For example, if you have a “Responsible” field (type User picker) in Jira customfields already and it is used in various projects, then you do not have to create it again. You can just select this existing field and map it to the table resulting in less custom fields in your system. This will increase your Jira performance and support a more flexible Jira configuration.